It’s ok to be chicken, or is it? Yes, I do have chickens, no I am not obsessed with them. 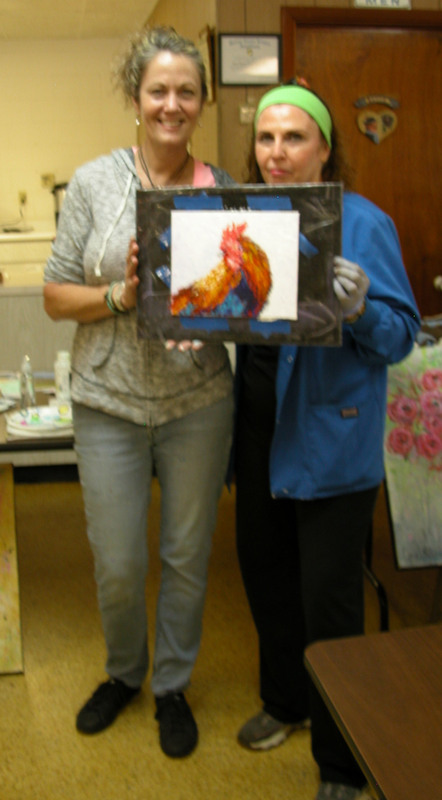 But my blog today is about a workshop and a rooster. Hopefully, I’ve made you curious! I admit to being chicken hearted when it comes to workshops, training sessions, classes and the like. In general, learning something new with people I don’t really know that well, can be a nerve wracking experience, but I am getting better at taking a deep breath and signing up. Still, it feels like jumping off a cliff. The closer the time gets for the workshop, the easier it is for me to lose my nerve; so thank heaven for “deposits”. A deposit just makes it a lot more difficult to get out of the workshop. I need nerves of steel and a deposit seems like a commitment to me; it keeps me from backing out. 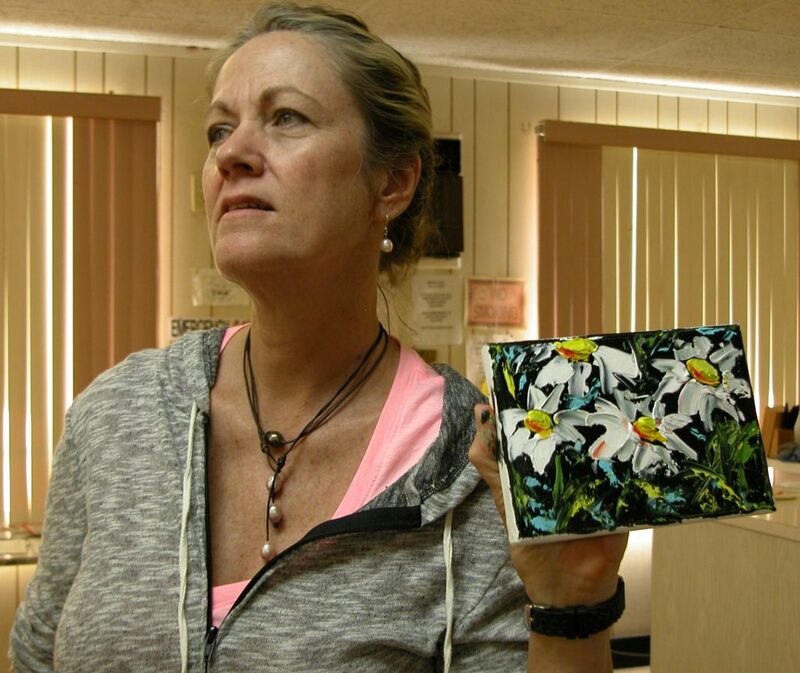 So I took a deep breath and signed up for a Lisa Whitener pallet knife class. What a joy it turned out to be! Workshops can be, but not always, pressure filled, inconvenient and uncomfortable because you and I know that everyone is making mental comparisons, or is it just me that does that? So WHY do I take them? Simply because I learn a lot. “A comfort zone is a beautiful place, but nothing ever grows there.”–Unknown I want to grow! Deep down I know everyone does, no one wants to stagnate. A pond with no circulation gets a lot of algae. We need the weeds to grow a beautiful garden. Gardens are messy and require work. Workshops are messy and they require work, but it moves my skill to a higher level, challenges me, allows me to see different approaches. Fortunately for me, Lisa is all about fun, all about Florida and is the opposite of an “art instructor snob”. She was refreshingly helpful, down to earth and gave a lot of great demos. You can see some of her work below and here. 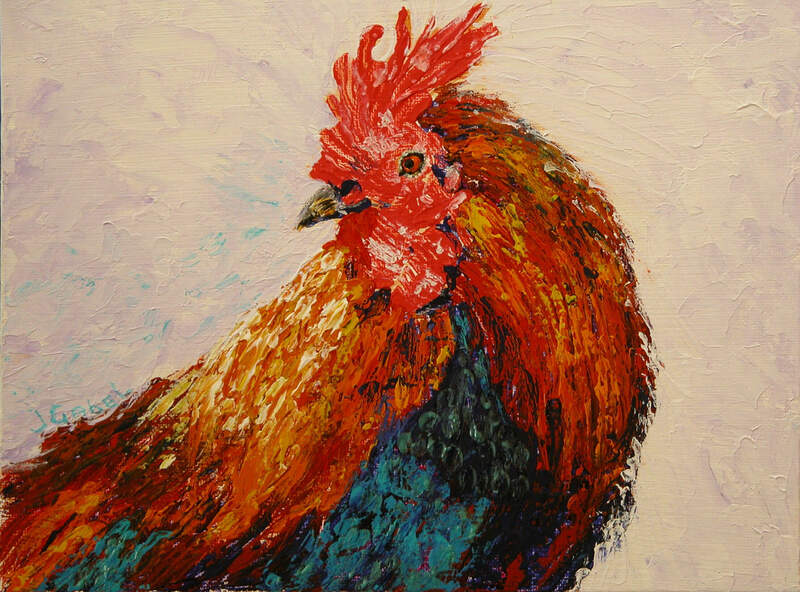 I chose to do a rooster with a knife (that’s pallet knife), after all rooster are courageous aren’t they? Lisa and the other friendly folks last Saturday reaffirmed that it’s worth the risk, learning something new. We are advised in 2 Timothy 1:7 that the Holy Spirit, God’s gift, does not want you to be afraid of people, but to be wise and strong, and to love them and enjoy being with them. Let me know what you think about workshops, training sessions, pallet painting and if you got a bit of encouragement learning something new lately.